You can read the original RR with all the pictures on advrider.com by clicking here. 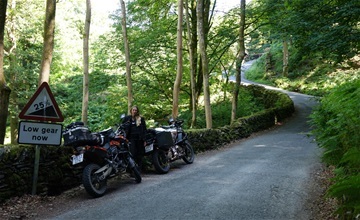 This would be our (my girlfriend Katrine and I) 3rd visit to the UK on 2 wheels. The first time was back in 2007 and then again in 2013. Both times we were blown away by the beautiful scenery, great riding and the hospitality we encountered all around the kingdom. The plan for this year’s trip was to focus on Scotland and to explore some of the green lanes and trails England has to offer. In regard to the later, I had put in an effort to locate tracks suitable for the obese pigs we were riding – Katrine an 800 GS and I a Super Ténéré. We set out at high noon the 16th of June. 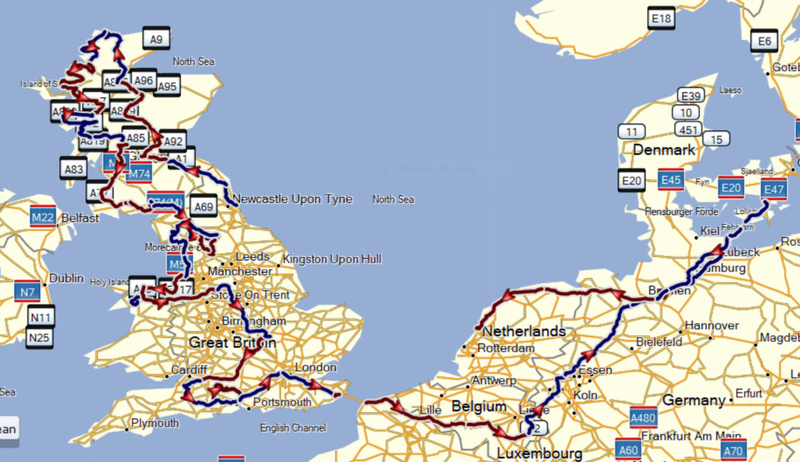 The first destination was Amsterdam, as we had booked tickets for the ferry to Newcastle. We had 2 days to get there, this allowed us to mostly stay off the highway and take a more scenic route. At the end of the first day we arrived in Oiden/Germany, where we stayed at a small cozy hotel. After dinner we took a stroll around town before heading off to bed. Well rested (and fed) we got back on the bikes the following morning. Before noon we crossed the border to Holland and a few hours later we arrived at the docks in Amsterdam 1½ hour prior to departure. After showing our tickets we rode directly aboard the ferry and strapped down the bikes. We spend the evening reading, talking and looking at maps before retiring to our cabin. The weather was calm and we got a good night’s sleep. In the morning the British coast was in sight at port. We just had time for breakfast before arriving in Newcastle. The disembarkment/border control procedure was a bit of a hassle and took a while, but it was still early in the day, when we finally were let loose. 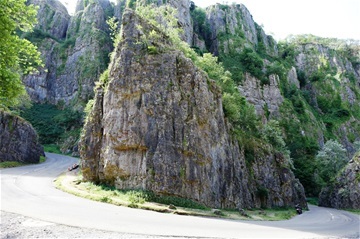 It required some attention at first to ride on the left side of the road, but as on previous visits it soon became second nature. From Newcastle we headed north through the charming countryside. As Katrine is a Harry Potter fan, we stopped by Alnwick Castle, where some of the scenes from the movies are shot. Early in the afternoon we arrived in Edinburgh. I had booked a B&B near the center. Mr. Zümo got a bit confused as we entered the city, resulting in some “creative” riding to get to where we wanted to go. We spend the rest of the day exploring the charming city on foot. When we got back to the B&B Katrine was off to bed. I stayed up another couple of hours to catch up on the weekends MotoGP races. We started the day with our first (of many) full English breakfast of the trip. Stuffed like foie gras geese we got back in the saddles and wound our way out of the city. We did a detour to marvel at the Falkirk Wheel and a short ride from there at The Kelpies – both part of the Forth and Clyde Canal. From there we continued north on scenic roads. We stopped for lunch at a Tea Room in a small village. Late in the afternoon we arrived at Ian and Carol’s place just north of Inverness. I had got in contact with Ian through his offer in The Tent Space Thread. In the evening Ian and I spend some time poring over maps of Scotland. 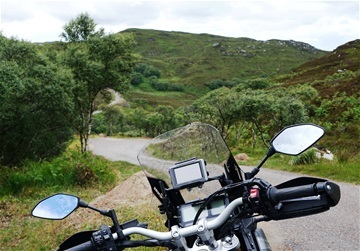 He know the Highlands like the back of his hands, so I was paying close attention - making notes for places to see and roads to ride. It had been pouring down all night. We enjoyed breakfast with Ian and Carol before they left for work. During that time the rain had seized and the sun broken through the clouds. It was still early in the morning when we hit the road. Later in the morning we passed by Crask Inn. According to Ian Scotland’s most isolated inn – I believe him. The theme of the day was great riding on amazing roads. We stopped for lunch at Cocoa Mountain in Durness - the northernmost point of our journey. From there we more or less follow the west coast. The highlight of the day was a single track road connecting Unapool, Drumbeg, Clashnessie and Lochinver. We had a few showers during the day, but all in all the weather was really nice. In the evening we arrived in Ullapool where we spend the night at a small motel. Yet again it had been raining all night and the clouds were still leaking when we left Ullapool in the morning. After about half an hour the sky cleared and the sun accompanied us for the rest of the day. Around noon we reached Applecross. We had lunch at the pub before climbing Bealach na Bà. During the afternoon we stopped at Eilean Donan Castle and Scottish Commando Memorial. After another long day packed with great riding and amazing views we arrived at a B&B just outside of Fort Williams. It was a 3 km walk to the nearest restaurant to get dinner - a good opportunity to stretch our legs and build up an appetite. Back at the B&B later in the evening, we chatted with a German couple. The woman was a Harry Potter fan like Katrine, and we got some input for the following day. In the morning we rode into Fort Williams to have a look at the Jacobite Steam Train – to Harry Potter fans also known as the Hogwarts Express. Shortly before its departures from the station, we got on the bikes and raced to the Glenfinnan Viaduct – another well known feature from the movies. We got there in time to park the bikes, walk to a viewpoint and see the train drive past. With the Harry Potter stuff out of the way, we could go back to focusing on the riding for a while. The day was a mix of twisty single track roads and fast sweeping sections – we even manage to squeeze in a short ferry crossing. The riding was great and the views stunning. The roads were packed with riders enjoying the fair weather. 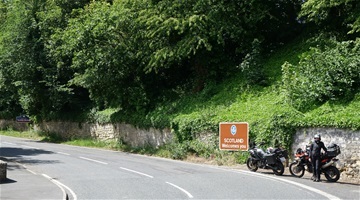 We passed by Tyndrum – a meeting place for local riders – en route to Callander where we had booked room at a B&B. We arrived in time to go for a run before dinner. We followed a 4 miles route suggested by our hostess. It turned out to a very tough and hilly trail through the forest past Bracklinn Falls. It felt great to be psychical active after a long day in the saddle – and it made dinner taste even better. During breakfast we started chatting with 3 English rides staying at the B&B. They were out for the weekend in search of fast roads without speed cameras. Their attitude towards riding was very different from ours, but we shared the love for life on two wheels and the talk flowed freely. Back in the saddles we started out with a nice ride through The Trossachs before passing through Glasgow. In the afternoon we reached Galloway Forrest Park. We had fun on Raiders Road – a 20 km gravel road through the forest. As a result the bikes were coated in dust when we pulled up at Huntingdon House Hotel in Dumfries. Terry the owner turned out to be a rider as well (which might explain the dedicated motorcycle parking). When we had dropped our stuff off in our room, Terry served cold refreshments (beer and GT) on the patio, where we hung out with Terry and 3 of his friends who had ridden up from Southampton for the weekend. There was an atmosphere of friendly banter. At some point Terry tried to sell Katrine an 8 week old Bulldog puppy called Bear. Katrine and I laughed a lot and really enjoyed the company. Later 5 of us went out for dinner together. The only time the talk seized during the evening, was when all of us were stuffing our heads with Salted Caramel Cheesecake from heaven. It was late when we got back to the hotel. Katrine headed off to bed while I followed the others to the bar, where Terry’s wife Lynne joined us for a nightcap. I have rarely encountered such a jovial host couple. After a good breakfast and more banter it was time for Katrine and I to continue our journey. Before crossing the border to England we stopped to have a closer look at Caerlaverock Castle. In the afternoon we met up with John and his son Will in Sedberg. John is the Godfather of the TET. I’m the linesman for Denmark. When John heard that we would pass through his neck of the woods, he had invited us to stay with him. We all arrived at the agreed place in Sedberg at the same time. It was nice to finally meet the guy that I’ve been communicating with on a regular basis for the last couple of years. After a short chat we got back on the bikes. John wanted to take us on a scenic ride through Yorkshire Dales. After a few kilometers we hit the first dirt roads. The trail started out in good condition, but soon deteriorated and became increasingly rutted. Not the ideal terrain for behemoths loaded with luggage. At some point I came around a bend and saw Katrine standing next to her bike sprawled across the track. She had been caught in a rut and thrown off the bike. We got the bike upright. It had some damage but after some fiddling it was rideable. Katrine had hurt both legs but nothing sprained or broken. The ride could continue. 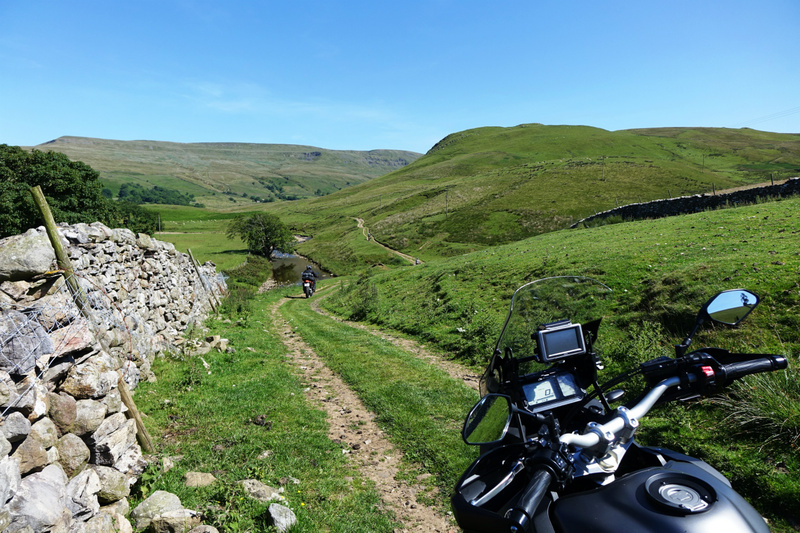 More trails and nice twisty roads led us to John’s place in Reeth. His wife Fiona greeted us with cold beers – just what we needed after a long, warm and strenuous day. As I did a routine check of my bike I discovered that both headlight bulbs were blown. In one of them the electrical filament had melted through the bulb - most likely as a result of all the bumps and vibrations during the day. After the beers we went to one of the local pubs for dinner. It was a very pleasant evening. Katrine hadn’t slept too well during the night, due to sore legs. She had several bruises and both legs were very swollen. John went off to work and we spend the morning around the house with Fiona and Will. Shortly before noon Katrine and I got on the bikes to follow a 200 km track around Yorkshire Dales that John had created for us the previous evening – it involved parts of TET UK. A few kilometers outside of Reeth we left the tarmac behind. The trail was great. Because of the pain in her legs, it was difficult for Katrine to handle the bike properly. Besides that the crash had dented her confidence so the going was slow. It was scorching hot with temperatures above 30°C. Later in the day we hit another trail section. The first part was uphill and pretty rocky. We hadn’t gotten far when a drain pipe across the trail caught Katrine out. She dropped the bike but didn’t get hurt. As we still had a long journey ahead of us, I cut out the rest of the days trail sections, to allow Katrine to recover a bit and build up some confidence (she is a very capable street rider). When we returned to Reeth, a BBQ had been prepared. We spend the evening hanging out in the garden. Talking to John it dawned on me just how much time and work he have invested in the TET project during the last couple of years. He has my deepest respect, as the TET would never have become a reality without a guy like him. In the morning I spend a bit of time working on Katrine’s bike. The bracket that holds the wind screen and instrument cluster was partly broken. I managed to stabilize it with zip ties Fiona and Will had purchased for me the previous day. It was still early when we said our goodbyes and headed off towards the Lake District following a route suggested by John. At a gas station I spend £8 on 2 new head light bulbs for the Yamaha. Late in the morning we arrived at Aira Force Waterfall. We hiked to the fall before having lunch at the tea room. The afternoon was spend riding south through the Lake District on scenic roads. In the evening we arrived at Paul’s place just outside of Liverpool. We got to know Paul a couple of years ago, when him and 2 of his friends stayed at our place on their way to Nordkapp. It was good seeing him again – and to meet his girlfriend Rebecca and her son Charlie. Paul used to live in the city, but then he met Rebecca who rides horses. Last year they purchased a house in the countryside with some land to it. Paul really enjoyed his new life. He had build stables and paddocks for the horses, a huge chicken coop and was now working on a proper manege. The place was crawling with all kind of animals. Sometime during the evening Paul wanted to show me his newly acquired trial bike. When he started it up, his 1 year old German shepherd attacked the bike and shredded a brand new rear tire. As Paul and Rebecca both had to leave for work, Katrine and I set out early in the morning. It was still early when we arrived at Bodnant Garden I Wales. Katrine used to work as a Gardner in the royal gardens in Denmark. As a result she has a thing with beautiful gardens. Bodnant Garden’s 80 acres blew her away. We spend a couple of hours exploring every corner of the garden. It was yet another scorching hot day. We were pretty roasted when we returned to the bikes. A short ride took us to Llandudno where we had taking Steve up on his TET space offer. When we pulled up in the driveway, we were greeted by Steve and his friend Marc. Marc would head out on a RTW trip a few days later. Steve has been riding a 660 Ténéré for some years and knows the bike inside out. Marc had picked the same model for the trip, and Steve was doing some electrical work on Marc’s bike to prepare it for the trip. Marc’s plan was to visit all 7 continents in 18 month. Quite an undertaking, especially as Marc had never ridden off road or wrenched on a bike. It will be interesting to follow his adventure. Steve’s girlfriend Lorraine got back from work late in the afternoon. Marc left soon after and Lorraine, Steve, Katrine and I went into town to get drinks and dinner. We ended up dining by the waterfront promenade at Dylan’s. The food was amazing. We had a great evening. Katrine and I slept late the following morning. The plan for the day was to do an underground obstacle and zip line course at Zip World Caverns located in the mountains an hour’s ride south of Llandudno. We arrived at the caverns around noon and spend a couple of hours playing around underground. Afterwards we returned to Llandudno and went to the beach with Steve. Later Lorraine joined us. We picked up Fish and Chips for dinner and went up to a house in the hills above the town to have a picnic on the terrace with a view over the town and the sea beyond. It was Lorraine's childhood home. Her parents had bought the plot next to it and built an impressive villa. Her father didn’t like to have neighbors, so he had kept the old house. No one lived there but the fridge was stocked with beer and wine for occasions like this. When the Fish and Chips were consumed we dropped by Lorraine’s parents to say hello. The view from their terrace as the sun set over the ocean was breathtaking. Back at Steve and Lorraine’s house, Steve helped me create an interesting route for the coming days, before we called it a day. When we got up in the morning Lorraine had left for work. We had time to share a cup of coffee with Steve before he took off. Half an hour late we hit the road. We stopped at a café in Llanrwst to grab some breakfast – followed by a nice morning ride through Northern Wales. From Horseshoe Pass we aimed for Macclesfield as I wanted to ride the Cat and Fiddle. 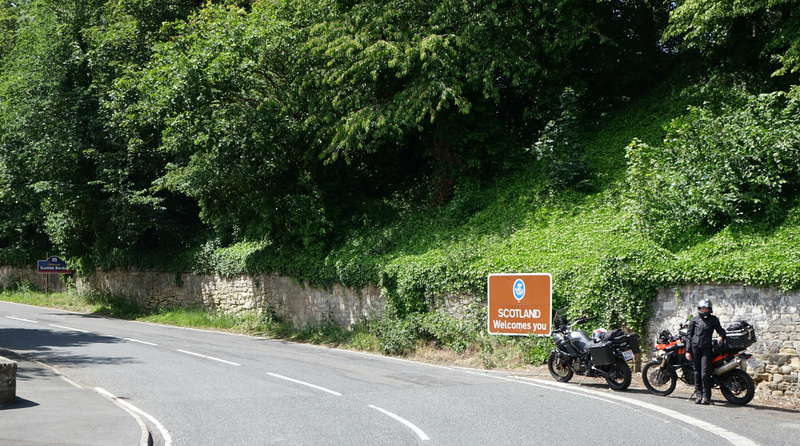 Nice road – and we made it to Buxton in one piece. We checked into a very nice B&B near the center with a view over the park and spend the rest of the day exploring on foot. It was prom night. The town was full of dressed up teenagers and there was a festive atmosphere. The next morning we rode a loop through the Peak District before heading south towards Rushden, where our friends Suzanne and Roger were staying with her parents while taking a break from a RTW trip. I visited them in Bulgaria in April, but Katrine hadn’t seen them for more than 2 years. We arrived in Rushden in the afternoon, and were greeted in the driveway by Suzanne. Our bikes were squeezed into the garage between a whole bunch of other bikes. Suzanne’s father Clive ran a Yamaha dealership for several years and the whole family is very passionate about motorcycles – especially racing. The rest of the afternoon was spend in the garden, catching up and sharing stories over cold drinks. When Suzanne’s mother got back from work, all of us went out to a very nice local Italian restaurant for dinner. After dinner we walked back to the house to have a nightcap while watching the qualifying for Assen TT the following day. We woke to yet another day where the temperature should exceed 30°C in the afternoon. We decided that the bikes were going to have a day off. It was nice just for ones to be able to wear shorts and sandals all day. After breakfast we went in the car with Suzanne and Roger to the picturesque village Stow-on-the-Wold. We strolled around and had an ice cream before enjoying a drink at one of the pubs along the river. Next stop was Stratford upon-Avon – Shakespeare’s hometown. We walked through town and had a picnic at the riverbank in a park. Suzanne’s mother had prepared a feast for us. Suzanne drove the car back to Rushden surrounded by the sound of the rest of us snoring. Thankfully she stayed awake. In the morning it was time to say our goodbyes and continue the journey. 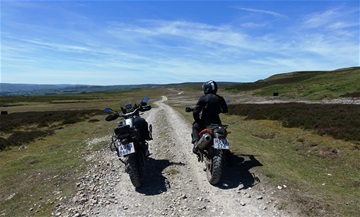 We only had a short days riding ahead of us, as we wanted to spend the day in Bath. The town had been on our list for both our previous visits to England, but for various reasons we had never made it – time to remedy that. Early in the afternoon we arrived at a B&B near the center of town. When the guy at the desk saw that we rode bikes and was suffering in the heat, he relocated us from the 2nd floor room we had booked to a bigger, more luxurious and nicely chilled room in the basement, and made room for the bikes in their garage. Brilliant service! Ones out of the motorcycle gear we set out to explore Bath on foot. It turned out to be as charming as expected. We did a tour of the Roman Bath, strolled around town and had a late dinner at a Caribbean style restaurant next to the river before returning to our B&B. After a good night’s sleep and a hearty breakfast we left Bath behind and rode through Cheddar Canyon before arriving at Glastonbury Tor. We walked to the top to enjoy the scenic view. We continued on small roads through the countryside. As we were a bit ahead of schedule, we took a long break in New Forest during the afternoon, lounging in the shade of a tree. Early in the evening we arrived in Eastleigh where Allen (a fellow adv-inmate) had offered to host us and take us for a ride in the area. We were greeted by Allen and his daughter Sophie. Later his wife Lorraine joined us and we had an extraordinary tasty Indian dinner. The following day Allen had planned a ride for us. Shortly after we left his house we turned off the road and follow a nice and flowing trail through the forest – the kind of trail only a local would know. Later we hit gravel roads and sandy tracks on Salisbury Plain. An overcast sky kept the temperatures at a comfortable level. A military exercise was going on, so we shared some of the tracks with tanks and armored vehicles. It was extremely dusty. On our way back to Eastleigh we stopped for a cup of coffee before doing the trail through the forest in reverse. It had been a great ride. As the day progressed Katrine started to relax, pick up speed and regain some of her confidence riding off road. I’m very grateful to Allen for picking a route that could do that. We spend the evening hanging out in the garden with the rest of the family. After having said goodbye to Allen and his family in the morning we ride to Windsor Castle. As the queues to get in is ridiculously long, we settle for a look from the outside. Next stop Ace Café. I’ve wanted to visit the place for years, but the prospect of enduring London traffic, have previously kept me away. Time to bite the bullet. As expected the traffic became very congested as we approached the City, but we managed to arrive at Ace Café without too much hassle. After a good look around and a bite of lunch, we got back on the bikes. It was scorching hot and we wanted to get out of the city ASAP in an attempt to beat the rush hour. Mr. Zümo decided to play a trick on us, taking us more or less directly through London. The traffic was terrible and the lanes too narrow for me to do much lane splitting because of the width of my panniers. At some point the ambient temperature gauge on my bike read 45°C – no fun at all! When we finally got out of the city, we stopped at a gas station to get out of the riding gear for a moment and get something to drink. Katrine went to the bathroom and soaked her T-shirt to cool down. From London we had a pleasant ride to a B&B outside of Folkestone. Katrine’s legs were almost back to normal after her crash in Yorkshire Dales, so we decided to go for a run before dinner. The hostess suggested a nice 4 mile loop through the countryside and along a canal. In the evening we strolled down the road to get dinner at the local pub. 15 minutes after we left the B&B in the morning, we arrived at the Euro Tunnel train terminal. As always the check-in procedure went smoothly. We got on the first departing train – 2 hours prior to our booked time. While waiting to board the train, we had a nice chat with a guy on a HD heading for Provence. Le Mans 24 hours was coming up, so the terminal was crowded with British people in sports cars going to the event. The crossing went smoothly and soon we were riding through France. In the afternoon we enjoyed some curvy roads in the Ardennes before parking the bikes in the garage at Baton Rouge in Vielsalm. Ben and Hetty who owns the place are friends of ours. It was good to see them again. As always the atmosphere was great and the beer flowed freely. After dinner Belgium was playing against Brazil in the football world cup. The match was shown at a big screen in the bar. There was no end to the enthusiasm when Belgium came out on top. It was late, when we retired to the dormitory. We got up in the morning to the last day of our trip. As we had 800 km to cover we made an early start. Most of the day was spend on the Autobahn. Late in the afternoon we arrived at the ferry in Puttgarden. We had dinner during the crossing. It was still early in the evening when we pulled up in our driveway - it was good to be home. We did a total of 6040 km during the trip. For us that is not much on a 3 weeks motorcycle trip. It was due to the weather that we didn't ride more. Most days during the last 2 weeks of the trip, the temperature exceeded 30°C in the afternoon. As long as we rode at speeds where the wind could cool us down it was tolerable, but on the small twisty roads that we prefer, the heat was killing us. As a result we often quit riding early in the afternoon, to get out of the motorcycle gear. No reason to ride when it feels like a chore. I would have loved to do more riding (especially in Wales), but the positive side of the shorter days in the saddle, was that we had more time to immerse us in the places we visited. 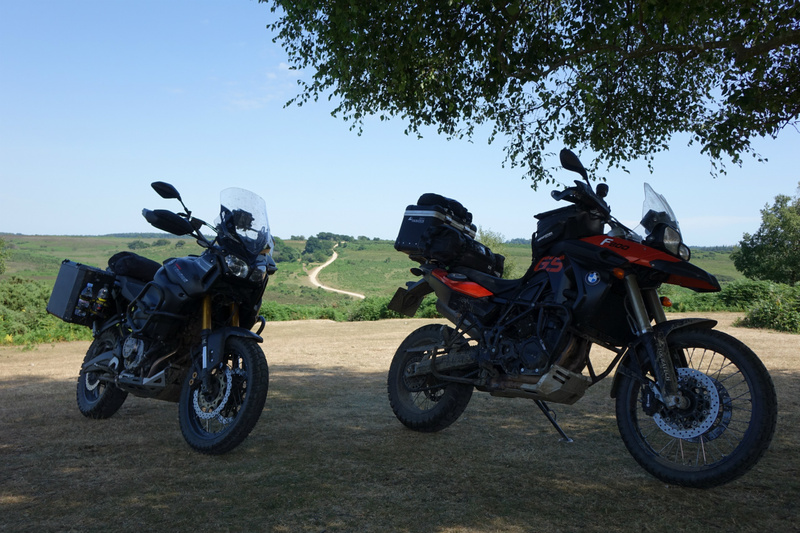 Both bikes performed well and were in most regards perfect for a trip like this. I say in most regards, as there was one area where they proved (not surprisingly) to be less than ideal - outside the tarmac. They didn't feel like fishes out of the water, but the weight and limited suspension travel and ground clearance (especially in regard to the Yamaha) meant that we sometimes had to be a bit careful not to trash the bikes. At the same time I was impressed with how well the Super Ténéré behaved on loose surfaces. It's well balanced and I enjoyed the engine characteristic and found the gearing to be spot on. All in all both bikes handled the trail sections pretty well, but it would have been much more fun on lighter more dedicated off road bikes. After Katrine's crashes in Yorkshire Dales we discover another negative side of riding big bikes outside the tarmac. The weight means that they crash hard. Even though she only had two slow speed spills the BMW sustained comprehensive damage. Besides the broken bracket earlier mentioned, a mirror snapped off, the handle bars, gear lever and side stand were bent, the exhaust dented and everything on the left hand side of the bike scratched. We decided to let the insurance take care of it after we got home. The total bill (parts and labor) amounted to staggering 8.300 euro. When I told John Ross, his comment was: " The parts must be made from unobtainium and crafted by brain surgeons"
As a result of Katrine's crashes (due to her injuries and the damage to the bike), we didn't do as much trail riding as originally intended. I still have the tracks I prepared prior to the trip, and hope to get the chance to explore them another time. Another thing I will mention is our choice of tires for the trip - MotoZ Tractionator GPS. They performed really well. On tarmac they provided impressive grip both in wet and dry conditions. They were trust inspiring on dirt, gravel and rocks - and in soft spots (mud and sand), where a more street orientated tire most likely would have left us stranded, they kept the bikes moving and on track with no issues. The only downside running these tires is, that they create vibrations (similar to any other 50/50 tire) when riding on smooth tarmac. As I write this the tires have done +18.000 km on the Super Ténéré and still have plenty of life left - I estimate that they are less than 2/3 down to the wear indicators.